Do you sometimes get the feeling that things are bad and terrible all of the time? Well, they are. But! There are rays of hope and joy that break through the clouds of our misery on occasion. 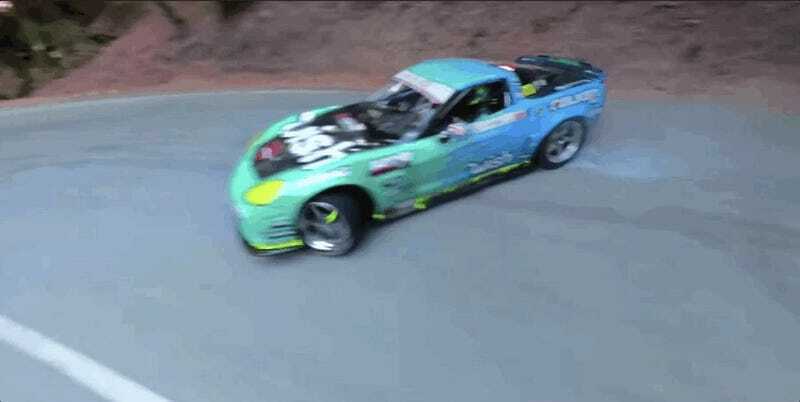 This drone-shot video of Formula Drift racer Matt Field’s 1,060 horsepower Corvette tearing up a mountain road is definitely one of them. The Corvette and its noise are fantastic, of course, but what makes this really stand out is the innovative aerial photography. The drone shoots out of a forest and tracks the ‘Vette as it lays down tire smoke and gets thoroughly sideways as it shoots down the mountain road. Midway through, there’s even a refuel and a tire change, followed by a close call with a guard rail. This is drifting, after all. Anyway, it’s as good a way as I can find to start your day. Enjoy.